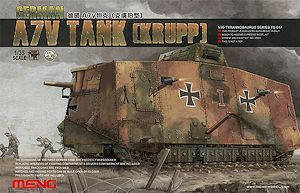 This new update set from ABER is designed for the recent MENG German A7V Tank (Krupp) (kit TS-017) and consists of a turned aluminium 57mm Maxim-Nordenfelt cannon barrel tube and six 7.92mm MG08 machine gun outer water cooling jacket and MG muzzles plus a length of brass rod for the MG trunnion mountings for a total of 14 parts. 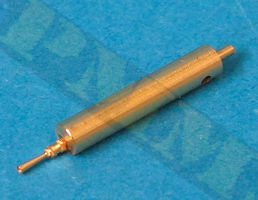 The standard of machining is excellent with the only cleanup needed is to cut the machining support base from the fine muzzle along with cutting the brass rod into 5mm lengths. 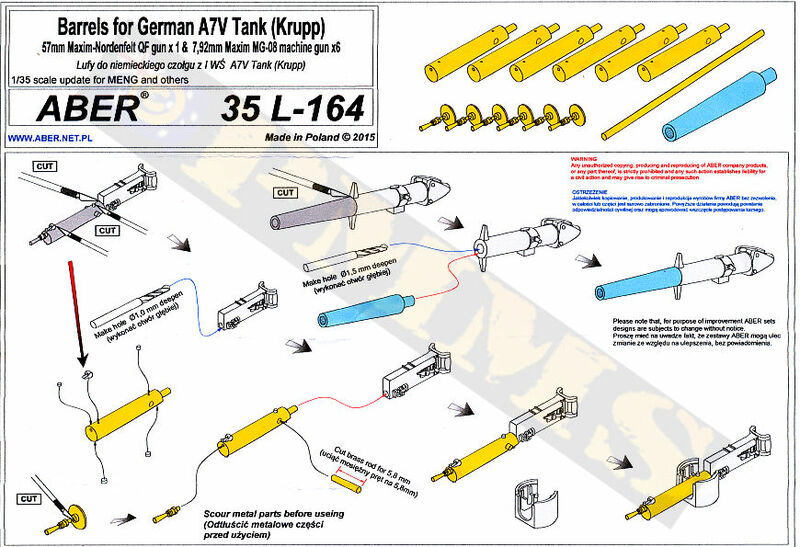 Also included is the standard ABER instruction sheet with clear easy to follow assembly sequences. although I did deviate from the instructions a little to make assembly easier as we will see. There is a little bit of assembly needed for these barrels requiring a bit of care due to the small parts involved, you are also required to carefully cut some of the plastic kit MG details off and re-use on the brass cooling jacket which again does require some care as does fitting the very fine MG muzzle. After assembling one of the MGs I would recommend fitting the 5mm section of brass rod for the gun trunnion pivots before anything else, this was due in some part to the very tight fit of the rod through the hole in the jacket that required me to use a jewellers hammer to knock it into place and doing this with all the small parts fitted is asking for trouble. Also with the pivot rod fitted this makes it a lot easier to fit the cooling jack at the exact right angle to the receiver when assembling the two, so doing this first has a couple of benefits. 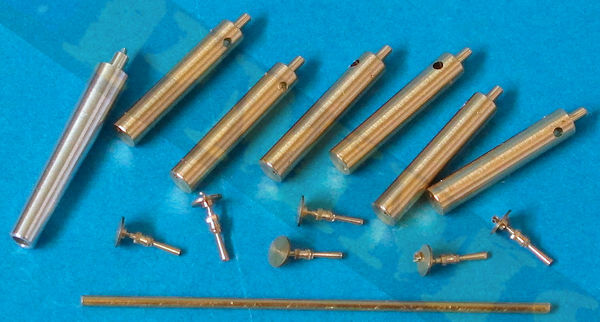 It is fairly easy to cut the brass rod into the 5mm sections using a fine razor saw or similar and filing the ends slightly to remove any burrs from the cutting. 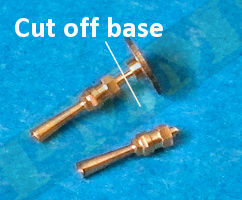 With the pivot rods in place you then cut the machining base from the fine muzzle, this can be done with a pair of model clippers and the burr filed smooth, you only need about 1mm of the pin remaining as the locating hole on the cooling jacket is not that deep. The muzzle itself is very finely machined with a drilled out flash suppressor for an excellent appearance after assembly. When gluing the muzzle to the cooling jacket ensue this is aligned correctly before the cyanoacrylate cures as the small locating pin can allow the muzzle to move about a little during fitting. With the muzzle/water jacket assembled we can move the kit MG where you firstly cut away the plastic cooling jacket from the receiver ensuring the end of the receiver is perfectly smooth and square, you then drill a 1mm hole for the brass cooling jacket pin, it does help if you mark the centre line of the jacket on the receiver with a soft pencil before cutting the jacket away. You then simply glue the cooling jacket pin into the receiver hole with cyanoacrylate noting the correct position of the muzzle and using the pivot pins to align the jacket at right angles to the receiver as mentioned earlier. Once fitted you then carefully with a shape scalpel blade (I use an NT cutter blade for very fine cuts) cut away the moulded on plastic detail from the kit cooling jacket and glue to the corresponding position on the brass jacket. I only cut one detail at a time as they are extremely small and you don't want them lying around to get lost while gluing another. With the small details added you can them assemble the remainder of the MG as per the kit instructions. 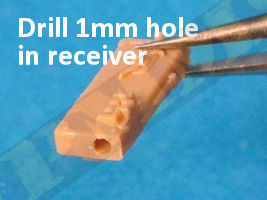 Carefully cut away the plastic sleeve from the receiver and drill a 1mm hole in the receiver for the locating pin. Additional details carefully trimmed from the plastic sleeve and attached to the metal sleeve. 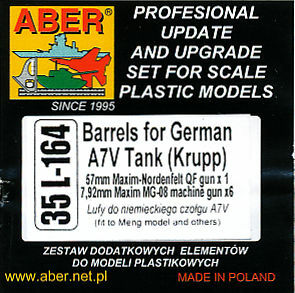 Assembly of the 57mm barrel tube is very straightforward, you simple cut away the kit tube from immediately in front of the shield mounting brackets and drill a central 1.5mm hole in the rear section of the barrel. The aluminium barrel tube is then glues in place and you are done with remainder of the cannon assembly as per the kit instructions. 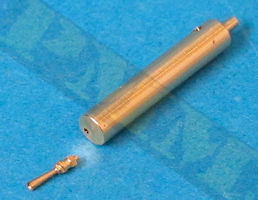 Cut away the outer barrel tube level with the shield mountings and drill 1.5mm hole for the metal barrel pin. 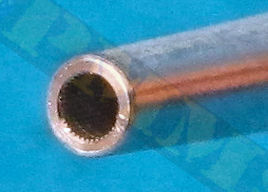 Attach the metal barrel to the rear barrel section, not the fine rifling included inside the barrel. The remainder of the gun is assembled as per instructions. These are the usual exploded view drawings with clear easy to follow assembly sequences, As mentioned above fitting the trunnion pivot rods on the MGs first will make life a lot easier. Another excellent update set from ABER with nicely done metal 57mm barrel tube with fine rifling. 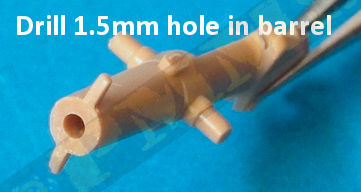 The 7.92mm MGs have excellent muzzle definition and while the cooling jacket is basically just a large brass rod to which you add the fine plastic kit MG details it is perfectly round without any mould seam lines to be removed. There is a little assembly required on the MGs due to pivot rod and transferring the kit details but should be well within the capabilities for those buy this type of update set. Thanks to for the review sets.